Now, I'm still living in a friend's basement, and there's no chance in the foreseeable future that I'll be decorating anything, much less my "outdoors." However, I don't let that stop me from keeping my dream house (and outdoors) alive. Nowadays it seems as through people are bringing their indoors furniture outside. And I like this idea. Obviously it's not true indoor furniture, but you get the gist. I love the idea of an extra sitting room outside, preferably with a roof or a cover, especially if you live in an accommodating climate, or at least if you have an outdoor fireplace to cozy up to. And kitchens are coming outside too. Not only will you find many ideas from the crew at BH&G, but hopefully you'll be inspired to make a few changes around your own home and garden. 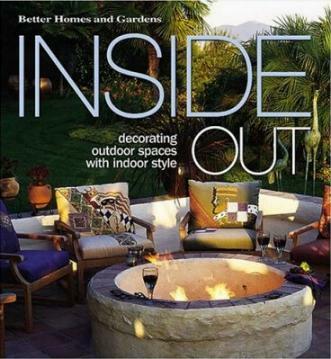 Pictures that caught my attention appear on pages 59 (outdoor shower - a fantastic idea), 86 (outdoor dining), 106, and 143. There are so many details in the photographs from which you can get decorating ideas for your own patio, deck, barbecue area, etc. They also cover outdoor hearths, gazebos, pools, pagodas, fabrics, gardens, and more. I didn't fancy the outdoor bedrooms - too scary for me, but I do like the idea of an afterneoon nap "outside" - see page 14. Conclusion - I loved their useful ideas - made me yearn for a place of my own.